Sri Lankan soldiers patrol along the 'de facto' frontline at Nager Kovil in the Jaffna Peninsula, north of Colombo, on April 6, 2008. Security forces smashed through defences of Tamil separatists in northern Sri Lanka, killing at least five rebels as the country marked the traditional new year, the defence ministry said Monday. Security forces smashed through defences of Tamil separatists in northern Sri Lanka, killing at least five rebels as the country marked the traditional new year, the defence ministry said Monday. 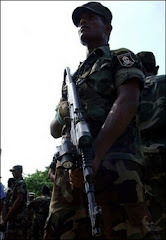 Government troops captured eight bunkers of the Liberation Tigers of Tamil Eelam (LTTE) in the Jaffna peninsula on Sunday, the day of the new year shared by the majority Sinhalese and minority Tamils, the defence ministry said. 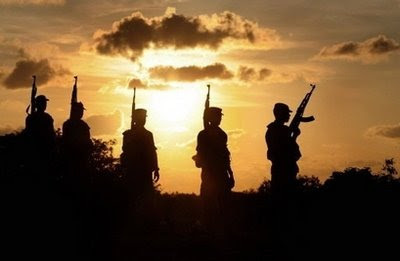 It said a total of five guerrillas were killed and another 16 wounded in clashes on Sunday while military losses were placed at one soldier killed and another wounded. The ministry figures show that at least 92 guerrillas had been killed since Saturday. However, the LTTE said in a statement on Saturday night that they lost only three of their fighters and claimed killing 25 soldiers. At least 2,850 Tamil Tiger rebels have been killed by government troops since the start of the year, while 172 soldiers have lost their lives during the same period, according to defence ministry figures. Verification of casualty claims is impossible as Colombo bars journalists and aid workers from travelling to embattled areas. Tens of thousands of people have died since 1972 when the Tamil Tigers launched an armed struggle to carve out an independent homeland in the island's north and east for Tamils.